Item is a folding camera for 5.7 x 8.25 cm (2.25" x 3.25") plate or sheet film. The camera was designed as the Nagel 18 by Dr. August Nagel for his company in Stuttgart Germany and renamed the Recomar 18 after the company was purchased by Kodak and became the German branch of Eastman Kodak: Kodak AG. 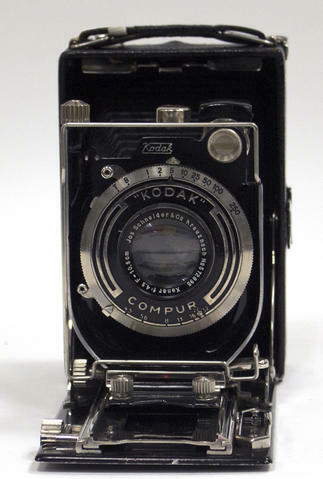 Lens is a Kodak compur. Donated to the Ryerson University Library and Archives Special Collection department by Dennis Cannon. Leather case, film back loaded with 5 sheets of Kodak TRI-X film, 7 film holders. From the Dennis Cannon donation, accession number 2012.001. Moved to the Heritage Camera Collection in 2013.